透明質酸是一種容易找到而珍貴的物質, 被证明是態刺激新的細胞增生。 透明質酸的特性, 容易被皮膚吸收, 是能夠儲存超過千倍的水份, 幫助皮膚吸收及儲存更多的水份, 使皮膚濕潤水凝,變得柔軟潤滑, 幼紋漸漸減淡, 使皮膚回後光澤及彈性. A naturally occurring substance found throughout the body, Hyaluronic Acid is proven to stimulate new cell growth. One of the most important biological attributes of Hyaluronic Acid is its capacity to hold 1000 times its weight in water, more than any other natural substance. 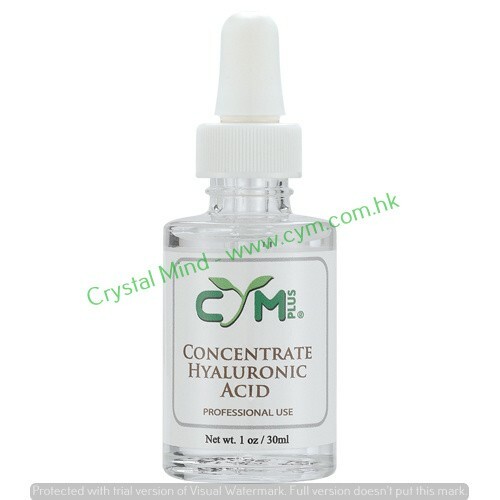 Hyaluronic Acid provides unsurpassed hydration. Directions: Apply to skin in a thin layer and allow to dry. Apply morning and evening.